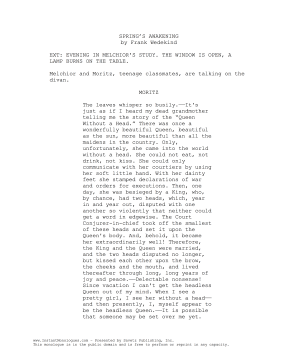 Drawn from a dialogue between two teenage boys in Frank Wedekind's Spring's Awakening, this 1-2 minute monologue comes from a young man named Moritz. EXT: EVENING IN MELCHIOR'S STUDY. THE WINDOW IS OPEN, A LAMP BURNS ON THE TABLE. Melchior and Moritz, teenage classmates, are talking on the divan. The leaves whisper so busily.--It's just as if I heard my dead grandmother telling me the story of the "Queen Without a Head." There was once a wonderfully beautiful Queen, beautiful as the sun, more beautiful than all the maidens in the country. Only, unfortunately, she came into the world without a head. She could not eat, not drink, not kiss. She could only communicate with her courtiers by using her soft little hand. With her dainty feet she stamped declarations of war and orders for executions. Then, one day, she was besieged by a King, who, by chance, had two heads, which, year in and year out, disputed with one another so violently that neither could get a word in edgewise. The Court Conjurer-in-chief took off the smallest of these heads and set it upon the Queen's body. And, behold, it became her extraordinarily well! Therefore, the King and the Queen were married, and the two heads disputed no longer, but kissed each other upon the brow, the cheeks and the mouth, and lived thereafter through long, long years of joy and peace.--Delectable nonsense! Since vacation I can't get the headless Queen out of my mind. When I see a pretty girl, I see her without a head--and then presently, I, myself appear to be the headless Queen.--It is possible that someone may be set over me yet.